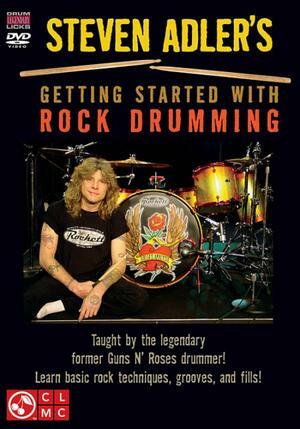 2010 will see Steven Adler returning to “Celebrity Rehab 3” as a special guest and the worldwide release of his first instructional drum DVD. Steven also recently contributed drum tracks to former “GN’R”, current “Velvet Revolver” guitarist Slash’s solo record. The track, which marks their professional reunion, also features Flea from “The Red Hot Chili Peppers”. Looking to conquer the literary world as well, Steven is finalizing a major publishing deal for his tell all biography. Of course Adler’s Appetite will continue to tour extensively and is currently working on new material set for a 2010 release. Steven Adler, best known as the original drummer of “GUNS N’ ROSES”, one of the most influential, ground-breaking hard rock bands to emerge from the late-80’s L.A. hard rock scene, has returned to pick up where he left off. 2008 saw Steven become a household name as the breakout star of the VH1’s hit series “Celebrity Rehab 2” and “Sober House”. Steven has made multiple appearances on Dr. Drew’s nationally syndicated radio show “Loveline,” and was an award presenter at the 2009 POLLSTAR AWARDS. Building upon that momentum, Steven decided to redefine “Adler’s Appetite” and put together what both fans and critics have called the strongest line-up of the band to date. “Adler’s Appetite” consists of veteran and platinum selling artist Chip Z’Nuff (Enuff Z’Nuff), guitarists Alex Grossi (ex- Quiet Riot) and Michael Thomas (Faster Pussycat). On January 17, 2009, the band made its debut to a maximum capacity crowd at The Key Club in Los Angeles. They were greeted with rave reviews and haven’t looked back since. Now, with the completion of two U.S. tours and a highly successful South American tour in 2009, with nothing short of a stellar response, “ADLER’S APPETITE” is giving the fans what they want and breathing new life into the legacy that is “GUNS N’ ROSES”.